Note: When the station opened the area in its vicinity was sparsely populated, but Choppington Colliery, about half-a-mile north-west, was in operation, with several rows of miners’ cottages adjoining, and some further cottages on the road north of the level crossing. By the close of the nineteenth century terraced cottages extended from south of the station (Sunnyside) for a mile northwards through Scotland Gate to the more substantial village of Guide Post. In 1911 the NER estimated that these communities provided a population of 6,680 within the catchment area of Choppington station. Choppington was close to the western end of the B&T double-track section, which reduced to single-track about 100yd west of the platforms. It was a busy station for many years - in 1911 it issued 115,642 tickets; however it ended its life, in 1950, with only one daily weekday train. A few years earlier the LNER installed electric lighting and small name tablets. 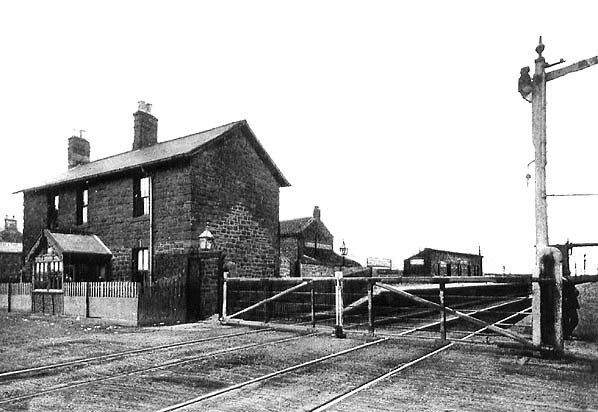 The station house of uncoursed stone, and at right-angles to the down platform, adjoined the level crossing. 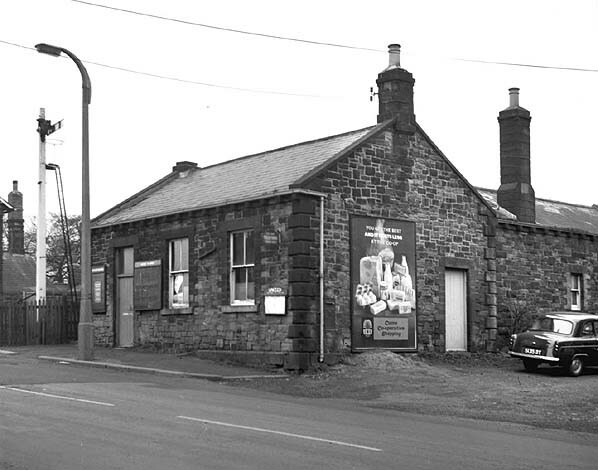 An L-shaped single-storey stone building which contained the booking office adjoined the up platform at the level crossing. On each platform waiting shelters were provided. 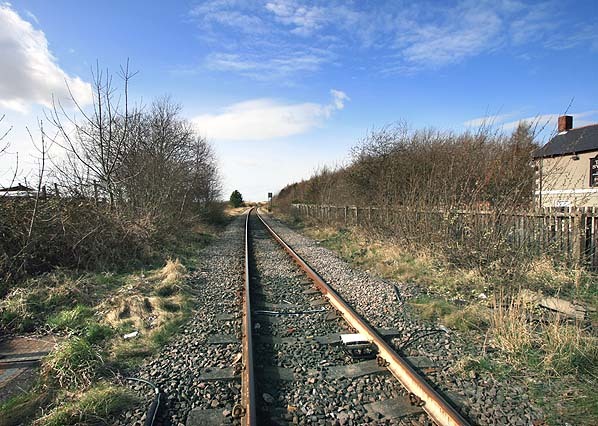 A siding, entered from the west, was found behind each platform, and a further siding (also from the west) curved south-eastwards to serve a brickworks, adjacent to the station; bricks were the only significant item of goods traffic. By 1922 both the brickworks and its siding had been removed. 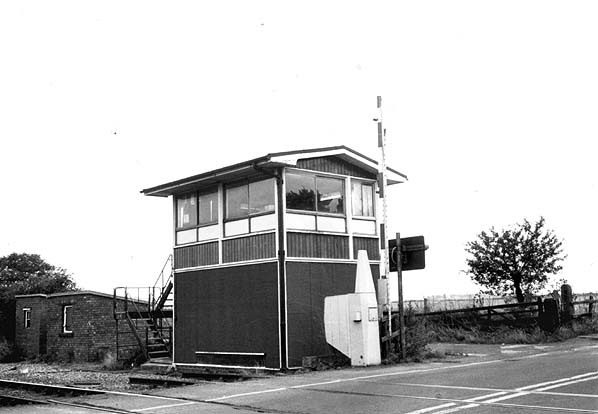 The signal box was immediately east of the level crossing, south of the tracks. Chris Hind. Route map drawn by Alan Young. Seaton Deleval, Hartley Pit, Hartley, Newsham, Blyth 2nd site, Blyth 1st site (on branch), Bebside, Bedlington, Hepscott & Morpeth B & T.
Looking west over the level crossing to Choppington station in the early twentieth century. The two-storey station house, built of uncoursed stone, is functional rather than attractive in appearance; the variations in its masonry are clearly visible, and they indicate that it was originally a single-storey cottage. On the south platform the enclosed pent-roofed waiting shed is equally unpretentious. 1897 1:2500 OS Map. Note the brickworks, south of the station, with rail access. 1922 1:2500 OS Map. The brickworks and siding have been removed. Looking west from the north platform at Choppington. 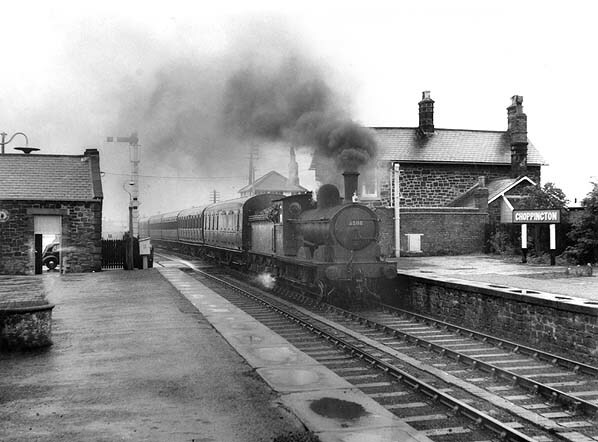 The station lost its sparse passenger service of one Blyth to Morpeth morning train – no advertised trains in the opposite direction – in 1950. The LNER added its running-in boards and electric lighting and name tablets. The two-storey stationmaster’s house is on the south (right) platform, whilst the single-storey station building is on the extreme left. The engine in this photograph, 65110, was built in November 1892 at Gateshead Works to the Worsdell J21 design. Originally built as a compound, this loco carried the number 1609 upon entering service. Converted to simple working in March 1908, this loco had a working life of over 67 years and 7 months, when it was withdrawn from Darlington shed in July 1960 and cut up at the works later that month. The modest station building at Choppington on the north side of the level crossing. The L-shaped single-storey building is constructed of uncoursed sandstone. Although closed for 14 years, this photograph of March 1964 shows the poster boards still in place. 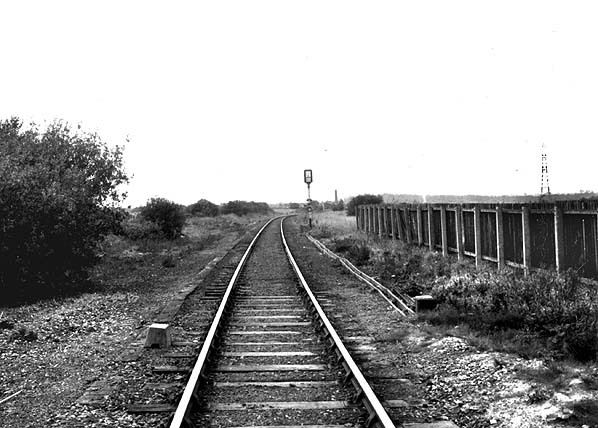 Looking west at Choppington in September 1978. The platforms and buildings have been demolished and the track has been singled. The modern signal box at Choppington in September 1978. It has now been demolished. 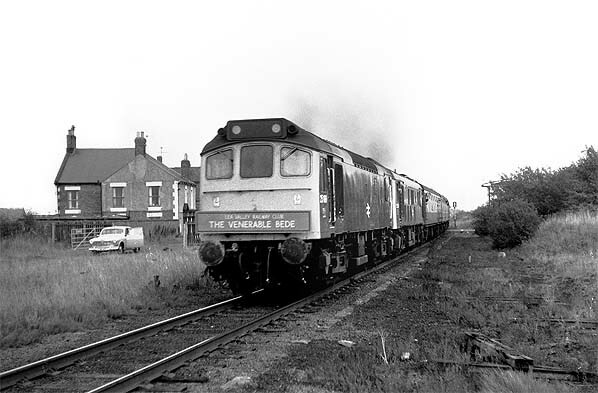 On 6 October 1979 the ‘Venerable Bede’ railtour organised by the Lea Valley Railway Club passes westwards through the site of Choppington station, hauled by 25189 and 25236. Looking west at Choppington in March 2009.